Joel started working with us in 2013. He is our daytime guard and does a great job. He is a humble man full of integrity and a heart to serve. 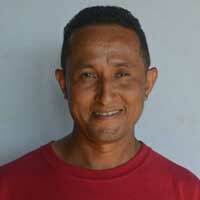 He lives in Santa Matilde and comes to serve the Candelaria property 6 days a week. His own words coming soon. Eduardo Samora Tijerino was born November 19, 1969 in Chichigalpa, Nicaragua. Eduardo grew up his entire life living in Chichigalpa. As many of the men in this community he worked in the sugar cane fields. After 17 years of employment in the fields he fell ill to renal failure. 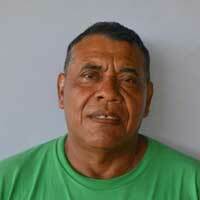 Eduardo has an eight year old son, Osmayer that he needed to support. He began looking for employment opportunities. After being suspended from the sugar cane company for medical concerns in 2009, he came to New Song looking for a job. He joined our team as one of the three security guards. Hector took over the cleanliness and advancement of the Candelaria property in 2013. He also works alongside the security team, and covers for them on days off and during their lunch breaks. He is from Nuevo Amanacer and an active man with his family at Bismark’s church. He is a great example of a husband and a father. Jakeline Liseth Arroyo Garcia is our terrific Chef who cooks all sorts of delicious food for the mission. She began working informally for the mission with her sisters in 2008 and became in charge of the kitchen on May 21, 2013. Jakeline is 28 years old is married to Ronyel Agusto Traña, who is 36 years old. Their children are: Brayan Antonio Traña Arroyo, Ronyel Agusto Traña Arroyo, and Norlan José Traña Arroyo, who are 13, 11, and 7 years old respectively. More than just loving to cook, Jakeline loves to serve all those around her and appreciates how everyone who works and lives at New Song treat her with much love and respect. She says she is grateful to the mission for always keeping her in mind and remembering her and her family, helping them out with work after the deaths of her nephew, father, and brother. Jakeline’s purpose is to be a good example for the mission and to always be bettering herself so she can accomplish that. Claudia Teresa Silva Sosa is our fantastic cleaning lady who is in charge of keeping everything neat and tidy and preparing beds and rooms for teams that come. She is 36 years old and has three daughters – Kelly Everlieth Poveda Silva, Claudia Nayzeth Poveda Silve, and Aneykis Angeli Poveda Silva, who are 18, 10, and 4 years old respectively. Claudia is treasured her for her calm and tranquil demeanor and for her sweet personality as she sweeps, mops, and wipes down all surfaces at the base. She says she enjoys all the friendships she’s made with the other workers and appreciates the trust she has in them. She loves how well she is treated and values the beautiful atmosphere she cleans in. Claudia’s daughters are very important to her and she feels so secure knowing that she has an assured job working for the mission, who provide her with money to buy her family food and necessities. 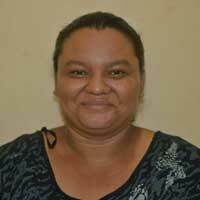 Yohana del Carmen Garcia is our Receptionist for the Café at the Base. She is 36 years old and is married to Henry Molina Gomez. Her two children are: Ariela Cristina Garcia, who is 13 years old, and Joshua Francisco Molina Garcia, who is 7 years old. 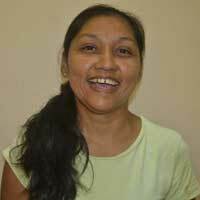 Yohana started working for the church on August 5th, 2013 and has been a valued member of our team ever since. Her happy and energetic spirit help her to develop friendships with all those who come to buy something and make her an easy-going and successful saleswoman. She loves that she starts her job in the morning, opening everything up and getting right to work. Yohana says that she likes to sell lots of things so that the Café is making money to fund the mission. Her passion for people gives her joy to attend to all the customers with love, especially the kids that come from Sunday School. Making new friends is another benefit of the job that Yohana loves, whether it be new Americans or Nicaraguans as well. She likes that she gets to work with her sister Jakeline. Yohana is extremely grateful for and loves all of her work that God and the mission have given her. Marling Elaine Centeno works for New Song mostly in the Bakery, packing bread and helping out with the bread vendors Monday through Friday. Saturday and Sunday Marling is in charge of selling at the Café. Marling is 25 years old and is married to Douglas Jose Hernández Alvaréz who is 25 years old as well. Her children are: Douglas Jose Hernández Centeno who is 5 years old and Nardely Elaine Hernández Centeno who is 5 months old. Marling has had experience working in other bakeries, but she says that she prefers to work for New Song and she feels like it’s her family here. She was baptized and married at our church. She enjoys the other people she works with and says they are all friendly and treat her with respect.